Three ominous men stepped out of a black car -- suit-clad; dead-serious -- and onto our neighborhood street at eleven a.m.on Sunday. One of them -- the mastermind, no doubt -- had donned a charcoal cheese-cutter cap to ward off the soft sunlight. (Evil, I thought. Only evil people wear that sort of a cap on this kind of a soft day.) They carried books under their arms. But the red, ribbon bookmarks belied their content: Lo! Bibles. Could they still be evil? My wife and I, sitting by the window and having our morning coffee/tea, let out a mutual groan. These people. Not evil -- just pushy. The conversation diced itself from a joyous repartee into stilted monosyllables as we continued to glance outside in order to ascertain how close they were coming to our door. There we were: two fat chickens awaiting the farmer's ax. Only this farmer wielded a Bible as the ax and he intended to send a metallic chill through our cozy Sunday morning with one fell swing. We watched them circle around our cul-de-sac, knocking on doors and thrusting papers forward. "They're coming," my wife said. We felt like the Fellowship in Moria. We could almost hear the Orc drums. I rubbed my furrowed brow. "You go to the door," I said. "I'm in my robe." She looked at me, as if she'd just realized I even owned a robe. "So? Maybe that will make them leave faster, if they see you are in your robe." "No," I said, firmly, speaking as if setting out the steps to an algebra problem. "You have pants on, at least. I make it a point never to answer the door without pants on, howsoever covered-up I may be." She sighed and and her coffee cup hand dropped slightly as she gazed out the window, watching them approach. "Besides, you're better at being mean," I continued. (She looked at me, deadpan.) "And you are hideous," I continued. (She's beautiful, for the record.) Maybe you will scare them away." Truth is, I have been known to get sucked into a twenty-minute conversation with these people. (But always with pants on. I want to keep that perfectly clear.) I had a real Catholic vs. Jehova's Witness throwdown with a rotund chap in a windbreaker one time. We each left our discussion convinced that the other was a demon sent to spoil God's Design. They came up the walk, smiling a tight-lipped smile at the kids, who were beating each other, gleefully. I looked at my wife. She looked at me. The clock ticked. Sweat beaded on my brow. Angular camera shots served up the consecutive moments of dread. Ostinato strings in D-minor; then, accellerando . . . I don't think my wife had heard the music, though. Calmly, she put her coffee down and got up and walked to the door. As she walked, I admired and even envied her pants. Still, I sighed in relief and sipped my tea, feeling quite a connection to my fortuitous robe. I patted it and giggled at my good fortune. "Hi," she said, at the door. "Hello," came the other voice, feigning pleasantness. (Give it time, I thought. He'll attack at any second . . . Wait for it . . . ) "Tonight is the anniversary of Jesus's death," he said. (One may smile and smile and be a villain, I thought, clutching my cup. It's coming.) "We wanted to invite you to join us at worship at seven o'clock. Have a good day." "You too," she said, shutting the screen door. That was it? Where was the philosophical debate? Where was the fire-and-brimstone? The Bible-thumping? The fisticuffs? The glowing eyes? I have to say, I was a little disappointed. I had hoped, at least, for an aerial dogfight between winged angels and demons riding dragons or something. She came back, sat, and handed me a pamphlet with a picture of Jesus on it. He looked like Alex Trebek with a beard. "I didn't even have to go into my Linda Blair impression to get rid of him," she said. "Hmpf, " I replied, shaking the pamphlet as if something would fall out. "That was it?" "That was it," she said, sipping. "Maybe I need to reconsider my pants rule. Those guys seemed pretty nice." Nevertheless, they must be wrong. 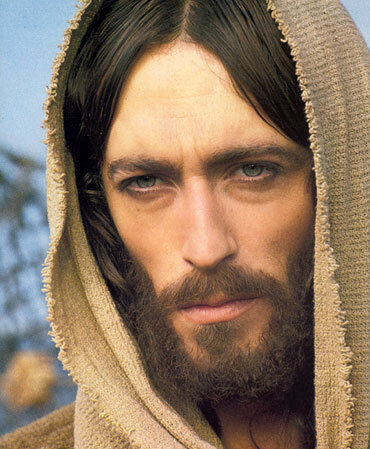 My Catholic brethren (and sistren, for that matter) all know that Jesus looks like Robert Powell. I sipped green tea and watched them vanish into their sinister Hyundai minivan and head back to whatever dank cave they use as a lair for the incubation of their insidious schemes. It's always the few bad eggs that ruin it for the rest of us...Chris, I would invite you to our Good Friday service, even if you weren't wearing pants. Porky Piggin' it. For shame. Ha! Thanks, Brian -- I'll be at Good Friday service with not only pants but a tie! I'll just skip the socks. Gina -- Heh. Porky piggin'it. This is hilarious. I had 2 come to my door yesterday morning while I was on the phone. I answered my door (pants and all : ) They noted my snazzy new LG Optimus and asked if there would be a better time to talk. While keeping the phone very visibly at my ear I told them "no thank you, I'm very firmly Catholic, but God bless and go in peace." They were very polite, apologized for disturbing me and off they went to knock on my unsuspecting neighbors’ door. Now if I were a really good neighbor, I would have hung up with my friend and immediately dialed the house next door. Oh well, what can I say? Alas I guess I'm really not all that nice after all : ) Who know a cell phone could also be used as land-shark repellent? : ) JK One of my best friends growing up was a JW. We're still friends today, theological differences and all. Imagine that. Every man for himself, I say -- let the neighbors come up with their own tactics. Imagine, indeed, how different the world would be if those with theological differences got along like you and you friend.